As I was walking through the student the other day, I saw a display with a couple of fliers saying tha t there was going to be meeting Wed. Nov 12 for student groups to learn how to promote their organization. Now, if I didn’t have a prior commitment, I would definitely attend but I have some thoughts. Why wasn’t this meeting held at the beginning of the semester? I understand the beginning of the semester is busy for everyone, incoming freshman, returning students and yes, even us grad students. It seems more ideal that a meeting where organizations can learn how to better promote their organization shouldn’t be in November. The first semester is almost over. A recent classmate of mine gave a presentation on fundraising for non-profits. One comment she made about non-profit event promotion was there is no such thing as too much promotion. Probably like many non-profts, the student organizations don’t have a large budget, so they have to be creative in the way they get the word out. Sometimes the typical flier just won’t do. Times Square is chock full of promotions going on. 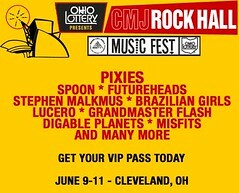 The Rock Hall only had 6 weeks to promote the CMJ Music Festival the first year and boy did they promote! They went to local establishments to hand out guitar pics with the event information, they had fliers, t-shirts, free music download cards. Employees spray chalked sidewalks and walls, they had magnets with the event information on their cars. I could go on. The point is, employees got excited about the event. If organizations feel that there is a lack of students, get out there and promote like crazy. put fliers in different buildings – the library, student center, Eastway Center, the Student Recreation center, different departments. As I was searching around the Center for Student Involvement site, there was no sign of this meeting being held.I think it’s great that there is going to be a meeting held for these organizations but I think they would have benefited more from the meeting had it been at the beginning of the semester. Here’s something to consider, even though it is geared more towards businesses. President-elect Barack Obama has brought change throughout this election and will bring change with him to the White House. Now you’re probably thinking, what does me mentioning Barack Obama have to do with public relations and student organizations. Well, here are my thoughts. I don’t even know where to begin. The College Democrats have had such a strong presence on the Kent campus since I started grad school back in August. Walking through the student center, the College Democrats always had their table set up handing out information to students. At Risman Plaza in front of the student center, they were encouraging students to register to vote. They chalked the sidewalks of campus, they handed out Barack Obama paraphernalia, they did a lot to get students excited and involved. I felt like there wasn’t a place on campus you couldn’t go without seeing the presence of the College Democrats. I wish I could say the same thing about the College Republicans on Kent State’s campus. I might have seen a table set up once at the student center, but other then that, there was very much a lack of presence by them on campus. Perhaps the students weren’t inspired with the Republican candidate of John McCain or that they were not as organized as the Democrats. Whatever the reason, as an organization, they need to communicate to the student body that they exist. One might think that there is no College Republican group on campus because they are never appeared to be around. Student organizations need to take advantage of all the opportunities they can to get the word out about their group. Social Networks – Embrace technology. Social networking isn’t going anywhere. Use them. Student Media – Get to know the student media and take advantage of Black Squirrel Radio, Kent News Net, and The Daily Kent Stater. Plenty of chances to get the word out about your organization with student media on campus. Classes – Get to know people in class to help promote events or your organization. Make announcements about the organization you’re involved with before or after class. E-Mail – Send a mass e-mail to the class. It can be easily done through flashline but make sure to e-mail yourself and blind carbon copy the class. The Student Center – Set up information tables in the student center about your group. Listservs – Have a listserv to encourage students to sign up with an opt-out option if they change their mind. I’m on the Catholic Student Association listserv and most of the time I can’t attend any events because I am in class but it is nice to get the e-mail every week to know what is going on. When I was an undergrad at UNC Greensboro, the first or second week of school, almost every student organization had a tent set up on College Ave. to get information out to new and current students. For the entire week, each group was outside from about 11 am – 4 pm encouraging students to get involved. Change is good and if student organizations want to boost their organization’s numbers or just have more of a presence on campus then maybe some of them need to change the way they approach their marketing strategies. If organizations stay static and don’t embrace change or technology, then they might not get get very far. One of the most recent trends among university campuses is to go green. Kent State is jumping on the bandwagon with a task force to help the school become more green. Not every school is going to be ahead of the crowd but here is a list of top ten schools from the Sierra Club who have already begun going green. I am all for the university becoming more energy efficient. This could be a prime opportunity for a new student organization on campus geared towards being more green. I didn’t come across organization on campus whose mission is to make the school more green. Say there is a group of students on campus who are interested in a “green” organization. I would encourage them to find out the credentials for starting a new campus organization. Once the organization is up and running, I would suggest alternate ways to get students interested instead of the typical posting of fliers around campus (which would help) and chalking on the campus sidewalks. Facebook is a prime place to get friends and other students to notice a new organization. A creative symbol and catchy name are important to a new organization as well. It wouldn’t be too hard to find out what other universities around the country are doing to get students involved with going green. The University of Wisconsin – Madison had an entire Green Week this past April. The State University of New York – New Paltz has a couple of organizations on campus geared towards going green. Carnegie Mellon University has an entire webpage, Green Practices, to going green. 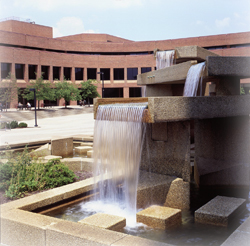 The University of Wisconsin – Seven Points has several student organizations as well. I think there is a great time for students to be creative, be involved with an important and hot issue right now and do their part in making Kent State more green.